This post contains amazon affiliate links that earn a small commission, but do not affect your price. This is the salad that got me hooked on kale.I have now posted so many recipes on kale but wanted to come back and share with you where it all started. This little chopped kale salad changed my green life forever. The truth is that even food bloggers have foods we are unfamiliar with, didn’t grow up, and maybe are even a tad bit afraid of. But, with a name like Spinach Tiger, I need to conquer all things green. After all green anything is so chic, it’s the new little black dress of instagram. Kale, as beautiful as it is, has always baffled me. I tried to make kale chips once, which ended up in the trash followed by a nice big empty bag of kettle cooked potato chips. I couldn’t enjoy them the way I read I was supposed to in about in every cool, hip or not so hip food and life style blog. (That doesn’t mean I won’t try again some day in far distant future). It makes no sense at all that my love for kale would start at a sports bar/restaurant that has five different kinds of french fries, but it’s true. Someone very smart at the Tavern in Nashville put a chopped kale salad on the menu. I ate the whole bowl right along with my french fries. How’s that for split personalities? I don’t remember the fries. I remember the tuscan chopped kale salad. It was spiked (and I used the word spiked on purpose) with lemon, lots and lots of lemon and some parmigiano reggiano cheese. I was hooked, and the very next day, I went searching for the freshest kale I could find. If you read my roasted okra post, I got lucky and and bought two beautiful bunches from a vegetable stand ready to close. I remembered how the salad tasted and I set to work chopping and chopping (using a mezzaluna) and spinning and spinning in the salad spinner, as kale seems to have a lot of water in it. The dressing was easy. Extra virgin olive oil, lemon and more lemon, a splash of pear vinegar, and an ingredient I thought should be added, crushed red pepper. And, of course, the toasted almonds. I decided to use pecorino romano cheese in slivers rather than grated parmigiano reggiano. You can decide which one, as you long as it’s freshly grated. In my experiences, everyone loves a salad at a party. 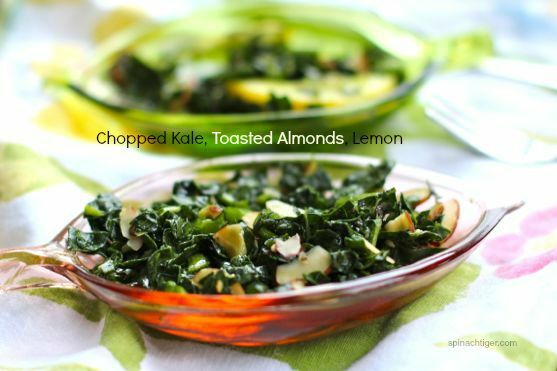 The chopped kale salad is perfect because you can dress it at home. It lasts all day without wilting. Trust me. People will thank you. Am I now a kale convert? All the way, yes. (Although still holding out on the kale chips thing). Oh I don’t need to tell you how healthy kale is do I? I hope that doesn’t ruin it for you. I know that I started to immediately feel better within the first two bites. And, it doesn’t hurt that I bought it from the hands that grew it. 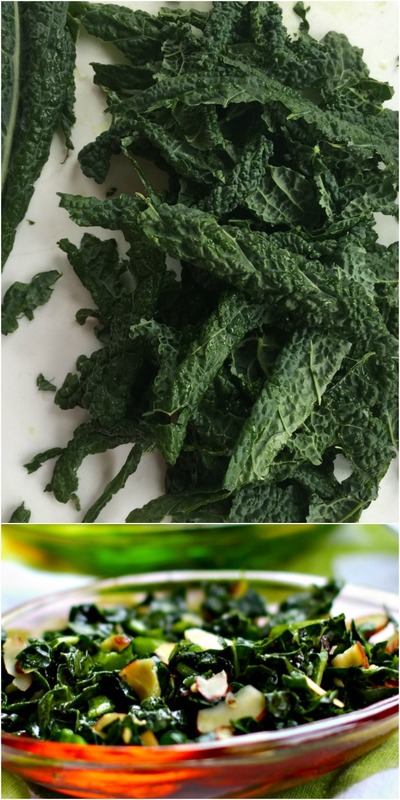 The texture of kale is hearty and takes well to an olive oil dressing and even gets better if chilled a few hours. It’s not mushy or slimy and maintains a certain crunch, which is always satisfying. Add to that more crunch from the toasted almonds and the zing of the lemon and crushed red pepper and you have an exciting healthy dish. That year the salad gave me a chance to use one of my birthday presents. I received three different vinegars from Sparrow Lane, and the one I decided on here was the D’anjou Pear. I have a thing for vinegars of all kinds and I have about 10 vinegars in my pantry, so stay tuned to hear about the other two, walnut champagne and peach champagne vinegar. All three are very different, very smartly balanced. I chose the pear because it goes well with lemon and pecorino, but I also like their golden balsamic. I wouldn’t use regular balsamic because it won’t have enough punch. I used lots of lemon and you could stick with that, but the added hit of vinegar not only aids in breaking down the kale fibers, but gives the necessary zing that a kale salad needs. Heidi Swanson of 101 cookbooks has a very similar recipe where instead of almonds she uses toasted breakcrumbs, another great way to get that added crunchy texture and a marked Italian profile. Since my original first kale salad post, I have made many kale salads. One of the crowd favorites goes a different route with apple, sweet potatoes, cranberries, and maple pecans. So tell me, is there a vegetable out there you have been afraid to try? If you say turnips, I can change your mind on that too. 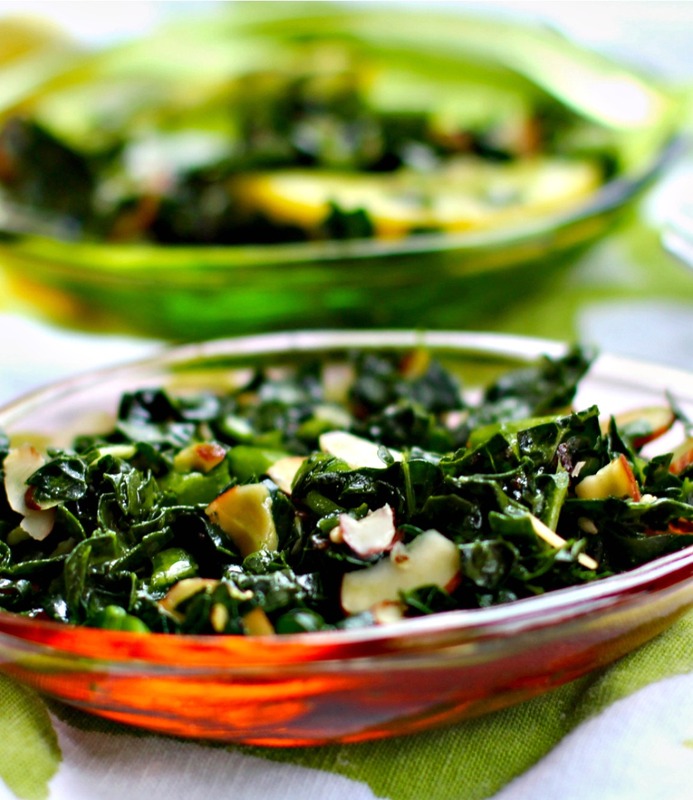 A raw kale salad with Tuscan flavors. Salad Dressing: Crush garlic clove, place in olive oil for 10 minutes. Remove. Squeeze lemon in small bowl, add vinegar, and slowly add in olive oil and salt and pepper. Rinse kale, roughly chop and dry with salad spinner or paper towels. Chop finely using a mezzaluna or chef's knife. Toss with salad dressing, cheese, toasted almonds and crushed red pepper. John I don’t have that figured out, but pretty high in nutrition, low in calories. Norma, I discovered that a minute in a pan just wilting is another option too, but a vinegar dressing helps to cook the kale a bit and make it very delicious texture. I am so into my kale and I used to sautee but now raw is fine with me. I am going green with my intake of food. Fun post, Angela. I just came home with a bunch of kale which, like you, is not a frequent vegetable in my kitchen. I’m delighted to know it doesn’t have to be cooked — and I may just make a similar salad tomorrow. LOL to the Lady Gaga reference! Joan, also try with apples, crispy bacon or prosciutto and cider type vinegar dressing. That’s my next one. I was introduced to kale through the River Cafe cookbooks. Great to see kale is now readily available at most greengrocers. Where does the cheese fit in? Just sprinkle on top? Tish, Whoops, I forgot it. Thanks for pointing that out. I just revised the recipe. Anchovies, I never thought of that, but it makes perfect sense to me. That healthy salad looks delicious! A great combination of tasty ingredients.